Long time community member Just John Clowdus joins me to tell us about his adventures into the world of game design. 'ScapeTalk does their part to help GenCon attenders enjoy their Best 4 Days in Gaming. Join the discussion and find Show Notes about this episode on the forums at ‘ScapeTalk: Hahn Talks GenCon Prep. 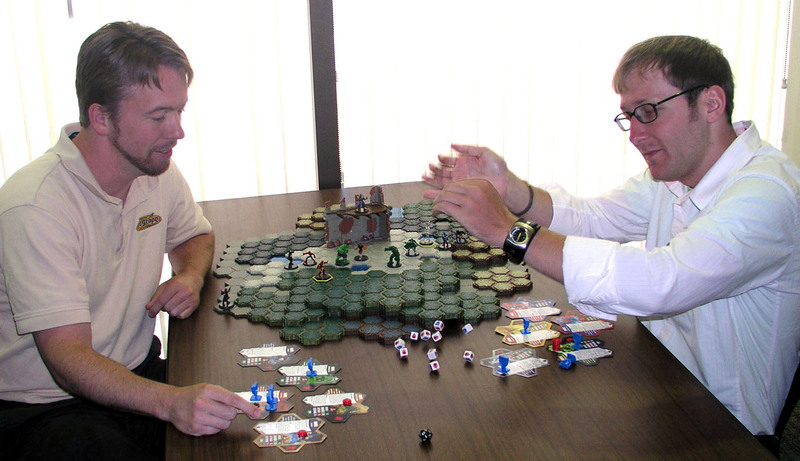 ‘ScapeTalk: Heroscapers Talk Heroscape, is a biweekly podcast formatted like a radio talk show, wherein I interview Heroscapers.com members on their favorite aspects of Hersoscape and Heroscapers.com. Guests will discuss custom unit design, map building, tournaments, community happenings, Hasbro Heroscape news, official unit reviews, and much more. Subscribe to the ‘ScapeTalk podcast in the iTunes Music Store. In a 'ScapeTalk exclusive, Heroscape Game Designer Chris Nelson makes his first public appearance with Craig to tell us about Marvel Heroscape and provide hints of future news. I have Tom Vasel from the popular podcast - The Dice Tower, join me on the show to talk about podcasting, games, and heroscape. Join the discussion about this episode in the forums at 'ScapeTalk: Tom Vasel Talks The Dice Tower'ScapeTalk: Heroscapers Talk Heroscape, is a biweekly podcast formatted like a radio talk show, wherein I interview Heroscapers.com members on their favorite aspects of Hersoscape and Heroscapers.com. Guests will discuss custom unit design, map building, tournaments, community happenings, Hasbro Heroscape news, official unit reviews, and much more. Subscribe to the 'ScapeTalk podcast in the iTunes Music Store. Bistro takes over the show and interviews Truth. Join the discussion about this episode in the forums at 'ScapeTalk: Truth Talks Cabbage'ScapeTalk: Heroscapers Talk Heroscape, is a biweekly podcast formatted like a radio talk show, wherein I interview Heroscapers.com members on their favorite aspects of Hersoscape and Heroscapers.com. Guests will discuss custom unit design, map building, tournaments, community happenings, Hasbro Heroscape news, official unit reviews, and much more. Subscribe to the 'ScapeTalk podcast in the iTunes Music Store.